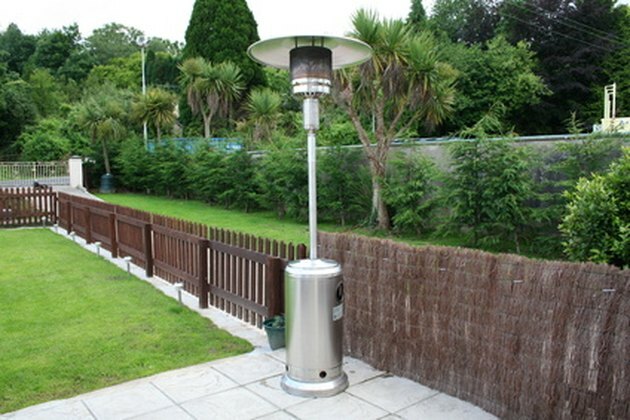 A patio heater can keep you warm and toasty when you want to sit outside in chilly weather, but it is worthless if it won't stay lit. Many factors, such as a downpour, blizzards and blustery weather, can come into play while trying to identify why the heater is not staying lit. Taking care of your patio heater by keeping it away from destructive weather and cleaning it occasionally can help it light up and stay that way. A patio heater should be cleaned six times a year. Stay clear of the elements. A breeze can blow out and rainwater can douse a heater's fire. Escape the rain by placing the heater under a canopy or an awning. Place the heater in front of a wind barrier, such as a tall wall, if harsh winds are the problem. Place it in a garage or shed when it is not in use. Clean the pilot. Such buildup as dirt, spider webs and oil will cause the heater's fire to go out. Turn off the gas, dampen a rag and wipe down the top of the heater. Use a towel to clean out the webs and dirt. Clean the thermocouple. The thermocouple, after four to five years of usage, can accumulate dirt and insects. Lift the protective flame screen off the heater, unscrew the nut and pull out the thermocouple. With a water hose, rinse the inside of the thermocouple tube, let it air-dry, then reconnect it. With a clean thermocouple, gas can travel to the flame easier and the heater will stay lit. Reconnect the loose gas valve, if necessary. The gas valve is the knob that lets you control the heater's gas pressure. Use a wrench to tighten the connection between the gas valve and pilot assembly. Don't tighten the valve too much or it will break. This connection will prevent gas leaks and help your patio heater retain its flame. Check for a gas leak. Mix soap and water in a bucket, then apply the solution to the patio heater's hose. If bubbles form when the heater is on, then you have a gas leak. Because gas leaks are extremely dangerous and tricky, it is highly suggested that you take your patio heater to a local service professional to repair one. Purchase a patio heater cover. Department stores, such as Target, Walmart and Sears, carry universal covers that come in several colors. Slip the cover over the heater and pull it down to protect the heater from the elements. Cecelia Owens started her professional writing career in 1990 as a writer/proofreader for TransAmerica insurance company. She wrote for the "Gonzaga Bulletin" and edits edits e-commerce websites such as Techwave and Bahatech. Owens has a Bachelor of Arts in journalism from Gonzaga University.